Agriturismo Cesani is located in the area of San Gimignano, 6km to the historical centre of this charming hilltop town. San Gimignano is a medieval art town which developed in Medieval times from an Etruscan settlement. San Gimignano flourished thanks to the Via Francigena, the ancient pilgrims' road linking Canterbury to Rome which runs through the town. The town is registered in the Unesco's World Heritage list, and it is known worldwide thanks to its imposing towers. The major art towns of Tuscany are a short distance to San Gimignano and they are all easily accessible on a daily trip (Siena 35Km away, Colle Val D'Elsa 10Km away, Monteriggioni 20Km, and Montalcino 90Km away). The Etruscan town of Volterra is just 25Km away, Pisa, with its famous Leaning Tower, is 90Km away and Florence, the birthplace of Renaissance, is 45Km away. Il Santuario della Santissima Madre della Divina Provvidenza is located in the small country village of Pancole, along one of the most ancient pilgrims' roads: the Via Francigena; Between 1475 and 1499, the painter and priest Pier Francesco Fiorentino frescoed the Holy Virgin with Child in the aedicule where the church stands today. Later the aedicule was neglected and fell down. According to the legend, in 1698, the Holy Virgin appeared to a shepherd , a little girl who was dumb from her birth. Since then the girl regained her voice and the aedicule became a symbol of Christianity. In 1670 the church was achieved and the ancient painting of the Holy Virgin was positioned on the altar. Another treasure is Pieve di Santa Maria Assunta a Cellole, a country church hidden among cypress trees not far from Pancole. This tiny jewel of Roman architecture was first mentioned in 1034. This three-nave church, in typical Sienese style, has small absides that create a charming atmosphere, and it also inspired Giacomo Puccini whilst composing the opera "Suor Angelica". The church is currently closed for renovation works, but the beauty of this ancient building is still visible from its façade, with an elegant mullioned window. 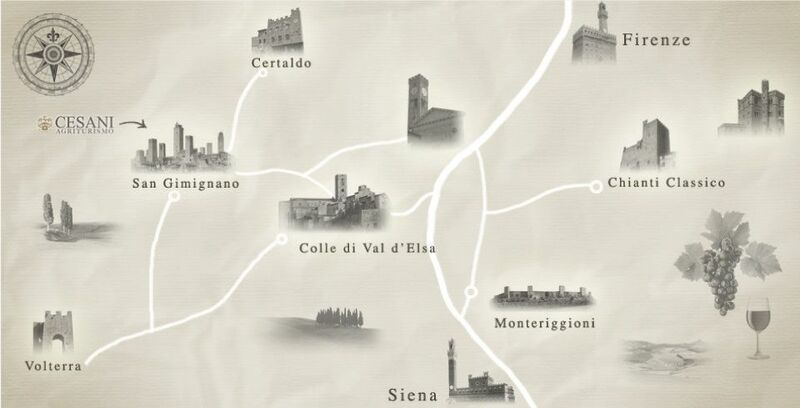 The historical centre of Certaldo is 6km away, at the end of a panoramic road. This ancient hilltop town has a castle overlooking the verdant Tuscan countryside. Certaldo is the home town of Giovanni Boccaccio, an important writer and poet of the fourteenth century, the author of Decameron. San Vivaldo is located on a mild hill in the woodland surrounding the hilltop town of Montaione. Also known as the Jerusalem of Tuscany, San Vivaldo is an extremely evocative place for both faithful and atheist people. It consists of a 17 chapels (originally 34) built in the sixteenth century by two Franciscan friars back from Holy Land, which reproduces the places and the events of Jesus.